The Floreana giant tortoise - a species that drew interest from Charles Darwin and that was long believed to be extinct - has a shot at revival thanks to restoration efforts underway in the Galapagos National Park. A breeding program begun by the Galapagos National Park Directorate gives conservation biologists hope that the species (Chelonoidis niger, also called C. elephantopus) can stage a return. "Charles Darwin was among the last people to see these tortoises alive - it's hard to believe their recent rediscovery will pave their way to restoration of the species back on its home island during the next decade," said Dr. James Gibbs an ESF conservation biologist who is also co-director of the Giant Tortoise Restoration Initiative (GTRI) coordinated by the Galapagos National Park Directorate (GNPD) and Galapagos Conservancy. The restoration program is based on a decade of exploration and genetic analysis of saddleback tortoises found on Wolf Volcano, the northernmost volcano of Isabela Island, which is part of the Galapagos archipelago. 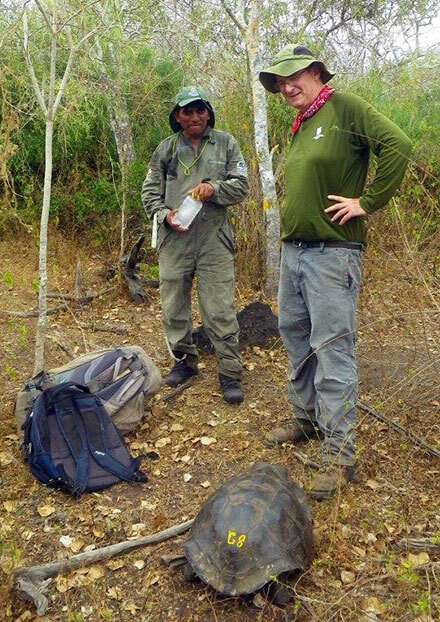 An expedition to Wolf Volcano in November 2015 was focused on locating and sampling as many saddleback tortoises as possible, and transferring some of those tortoises to the Fausto Llerena Tortoise Center on Santa Cruz Island. The search was aimed at identifying tortoises with ancestry from both Floreana and Pinta Islands, the former homes of two species of saddleback tortoises that went extinct on their home islands. Gibbs helped oversee that expedition. Genetic analysis of 150 saddleback tortoises (144 from Wolf Volcano and six already residing in the Tortoise Center in Santa Cruz) identified 127 with varying levels of ancestry from the Floreana tortoise. During the expedition, 32 tortoises were transported from Wolf to the Tortoise Center; of these, 19 were found to have Floreana ancestry. Unfortunately, no tortoises with Pinta tortoise ancestry were identified. Gibbs is among a group of researchers, led by investigators from Yale University, who reported these results today (Sept. 13) in the journal Scientific Reports - Nature. Based on preliminary results provided by the Yale University researchers to the GTRI, four breeding groups of tortoises, each with three females and two males, were established in March 2017. In approximately five years, offspring from these breeding groups will begin to be released on Floreana Island. The Floreana tortoise went extinct on its home island approximately 150 years ago because of exploitation by early settlers, and whalers and other mariners, who hunted the animals for food in the 18th and 19th centuries. Whether to lighten their load for the journey home or to make room for more whale oil, the mariners dropped a large number of tortoises from other islands at Banks Bay, at the base of Wolf Volcano. Throughout the last 200 years, these tortoises have bred on the volcano, providing a treasure trove of genes from a species that has long been extinct on its home island. The restoration of a tortoise population on Floreana Island with high genetic similarity to the island's original tortoise is part of a larger island restoration program, which includes the elimination of introduced species (rodents and cats), and the return of other species that disappeared from the island (the native snake and the Floreana mockingbird, among other possibilities).